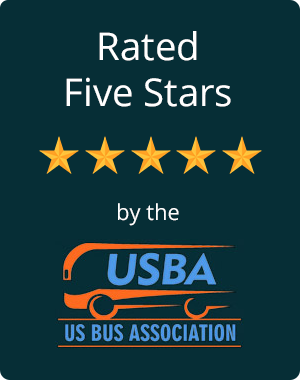 Securing a charter bus rental in Mesa and the rest of Arizona is a quick and easy process with Phoenix Charter Bus Company. We’ll transport everyone in your group throughout the Valley of the Sun for any type of event. Call us at 480-445-9823 to get a free quote for your next group trip around Mesa and beyond. Located southeast of Phoenix just between Tempe and Gilbert, Mesa is an important historic and cultural hub in the metropolitan area. Mesa is home to various cultural centers like the Mesa Arts Center and beautiful desert parks like Usery Mountain Regional Park. As the third-largest city in Arizona, traveling groups of all types will find something to do in Mesa. Easily organize a school field trip, wedding service, private vacation, corporate events, or sports trips around Mesa with Phoenix Charter Bus Company. With access to a large network of buses throughout Arizona, our services are suitable for groups of varying sizes. Rent a minibus for your private family vacation to one of the area’s many resorts or reserve a full-sized charter bus for your school field trip to the Commemorative Air Force Museum. Traveling to or around Mesa for a sports trip? Sports teams or tournament groups heading to Mesa will have plenty of space to store any necessary equipment. The charter buses in our network are equipped with spacious luggage bays and overhead compartments for team gear and personal luggage. We’ve provided excellent charter bus service to all types of sports teams and also groups of fans as well. Whether you’re headed to Hohokam Stadium to check out the Oakland Athletics spring training or your team is playing the field, a charter bus will ensure everyone arrives together and in a timely manner. Mesa’s desert landscape makes it a unique place to host a wedding service. Providing wedding guests with a shuttle service to your ceremony or reception will keep your special day running smoothly and on schedule. Phoenix Charter Bus Company will pair you and your wedding guests with a sleek shuttle to transport everyone to your elegant service at The Wright House. If you’re planning a wedding service in one of Phoenix’s many beautiful venues, a wedding shuttle will keep your guests together on the ride over to venues like Boojum Tree or the Desert Botanical Garden. Guests won’t stress finding the venue or getting lost on the way. You’ll have a local and professional driver dedicated to your special day. Educators, chaperones, and parents can rest assured that students are in safe hands while traveling in or around Mesa for academic trips. Each bus driver is well-versed in transporting large groups and has completed necessary background checks and drug tests before getting on the road. We’ll transport your elementary and middle school students to the Arizona Museum of Natural History or high school students for college tours at the University of Arizona in Tucson or ASU in Tempe. Students will stay entertained on their modern charter bus with free WiFi, televisions with DVD players, and more. Mesa is a prime location for private events like family vacations, reunions, or even just a trip with a group of friends. Offering a quieter atmosphere than the busy capital Phoenix, your group can relax and explore the natural landscape at Saguaro Lake Ranch or even shuttle to other locations across Arizona. Hit the pristine golf courses in Scottsdale or even travel up to the Grand Canyon to marvel at one of the world’s natural wonders. Your Phoenix Charter Bus Company rental will keep you comfortable in climate-controlled cabins wherever your travels take you around Arizona. Ready to book your charter bus or minibus for your next trip to Mesa? Call us 24/7 at 480-445-9823, and we can simplify your group’s transportation around Mesa for your entire trip. All you’ll need is a trip itinerary and number of passengers in order to receive a free, personalized quote from our rental experts.